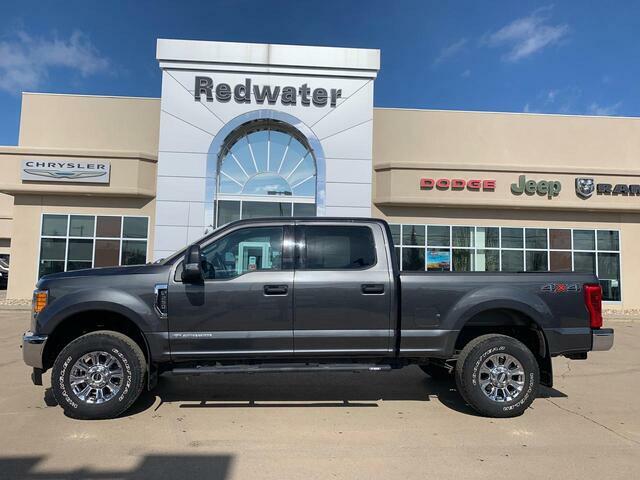 This Ford Super Duty F-250 SRW delivers a Intercooled Turbo Diesel V-8 6.7 L/406 engine powering this Automatic transmission. Urethane Gear Shift Knob, Underhood And Pickup Cargo Box Lights, Trip Computer. Transmission: TorqShift-G 6-Speed Auto w/OD -inc: (6R100), SelectShift and tow/haul mode, Transmission w/Oil Cooler, Tire Specific Low Tire Pressure Warning, Tailgate Rear Cargo Access, Systems Monitor, Steel Spare Wheel, Side Impact Beams, Securilock Anti-Theft Ignition (pats) Engine Immobilizer, Safety Canopy System Curtain 1st And 2nd Row Airbags, Regular Box Style. Treat yourself- stop by Redwater Dodge located at 4716 48th Ave PO Box 407, Redwater, AB T0A 2W0 to make this car yours today!